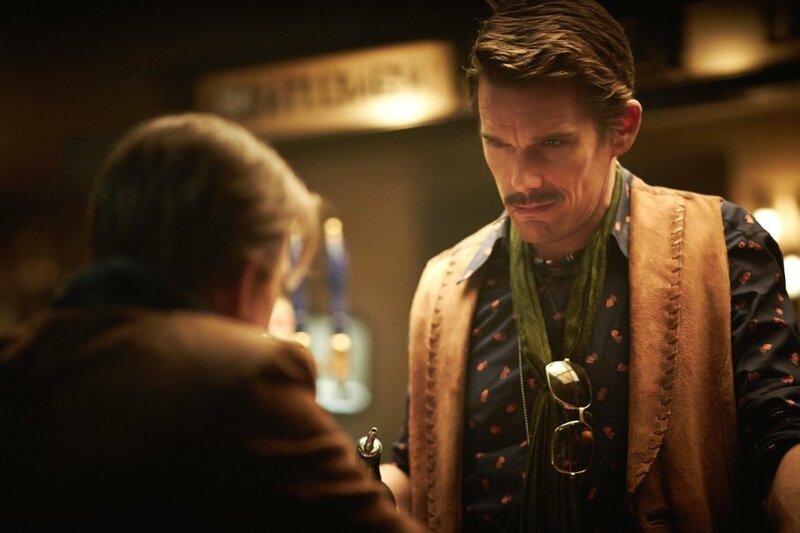 Under the direction of his mysterious boss, Mr. Robertson (Noah Taylor), a Temporal Agent – a detective charged with protecting the very fabric of time itself – goes undercover as a friendly bartender (Ethan Hawke) in order to make the acquaintance of a down on his luck writer. This leads to a cryptic, byzantine history lesson involving an unwed mother (Sarah Snook) who will deal with an unimaginable tragedy which inadvertently sets the stage for a time-jumping terrorist responsible for a number of horrific crimes that have violently shaped the course of history. 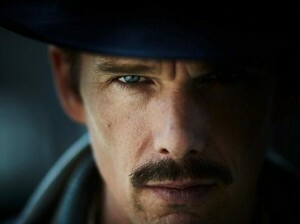 It’s hard to know how much to say about Predestination, a bizarre, Terry Gilliam meets Chris Marker meets Rod Serling science fiction thriller adapted from the Robert A. Heinlein story “All You Zombies” directed by Daybreakers filmmakers Michael and Peter Spierig (billed as The Spierig Brothers). One slip of the tongue ruins some of the more intriguing twists hiding inside the pretzel-twisting narrative, each secret building upon the next all so it can manufacture a somewhat shocking conclusion that’s admittedly more giddily amusing than it is surprising. This is a movie I’m positive I’ll be revisiting at some point in the near future even though I’m not exactly certain it’s deserving of one, aspects so mesmerizingly vexing their messy, frustratingly oblique nature nowhere near the problem they by all accounts should be. Hawke is terrific; Snook, forced to play so many different parts and roles it boggles the mind, even more so; both actors playing off one another to stunning effect, making the more ludicrous aspects of this time-dancing mumbo-jumbo seem oddly plausible in the process. The two of them are joined at the hip in more ways than one, and none of what takes place inside the confines of the film would likely be as palatable and as intriguing as it is if they were not up to the task at hand. Each actor invests themselves completely, their symbiotic give and take the vivacious fuel this engine unabashedly runs merrily upon. The script, written by the Spierigs, is a hodgepodge of science fiction tropes running the gamut from “Star Trek” to Back to the Future to 12 Monkeys to Timecop to everything in-between. It also evokes the lyrics from an endearing Dwight Latham and Moe Jaffe novelty song and does so with unconditional seriousness, gender roles and sexual identities weaving and winding back and forth in ways that are as perplexing as they are absurd. 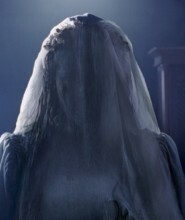 Plot holes abound, but the Spierigs do what they can to gloss over the majority of these by keeping the pace furious while also allowing cinematographer Ben Nott (Chinese Zodiac) and production designer Matthew Putland (Undead) to engage in painterly visual shenanigans that are impressively fearless. But these laudable distractions are still just distractions, and even for a time travel movie this one has more improbable absurdities than most, the conundrums and impracticalities it revels in getting more and more annoying as things progress. 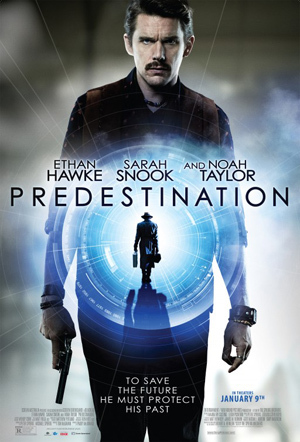 But less is more where it comes to Predestination, and while I was one of the relative few who enjoyed Daybreakers, make no mistake, this is a serious jump in both quality and ambition over that 2009 Spierig Brothers dystopian vampire cult favorite. Hawke and Snook slide into the proceedings seamlessly, while some of the ideas culled from Heinlein’s source material are indeed fascinating. More than that, though, Predestination, as whacky, odd and haphazard as it oftentimes might be, is just a heck of a lot of brain-twisting fun, and as such it’s 2015’s first motion picture I’m actually somewhat excited to get a second look at.